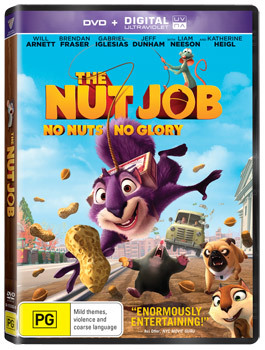 It's time to go nuts for this action-packed animated comedy featuring the all-star talents of Will Arnett, Brendan Fraser, Liam Neeson, Maya Rudolph and Katherine Heigl. Surly is a mischevious squirrel with a mission: to find the tastiest nuts for winter. When he discovers a whole store filled with his favourite food, he plans a heist of nutrageous proportions. But the place turns out to be owned by ruthless bank robbers, so it's up to Surly and his furry friends to stop the nearby bank heist and save the town. The fur is sure to fly in this hilarious adventure for kids of all ages.